James D. Julia's June, 2016 Rare Lamps, Glass & Fine Jewelry Sales Event Lights The Lamp With Over $2.8 Million In Sales! This breathtaking auction featured world class selections of antique and contemporary treasures from many private collections and included best-in-class examples from Tiffany, Daum, Galle, Wedgwood, Handel and Cartier, among many others. 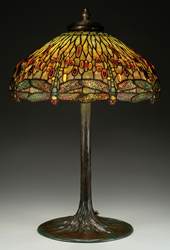 TIFFANY STUDIOS DROPHEAD DRAGONFLY TABLE LAMP REALIZED $130,000. Julia's recent rare lamps, glass & fine jewelry sale was a bright light indeed, presenting over 1,100 lots of the most desirable and attractive category selections to come to auction in years. These fine examples, which included lighting, decorative and functional arts, and jewelry, proved irresistible to collectors and enthusiasts from all over the world. 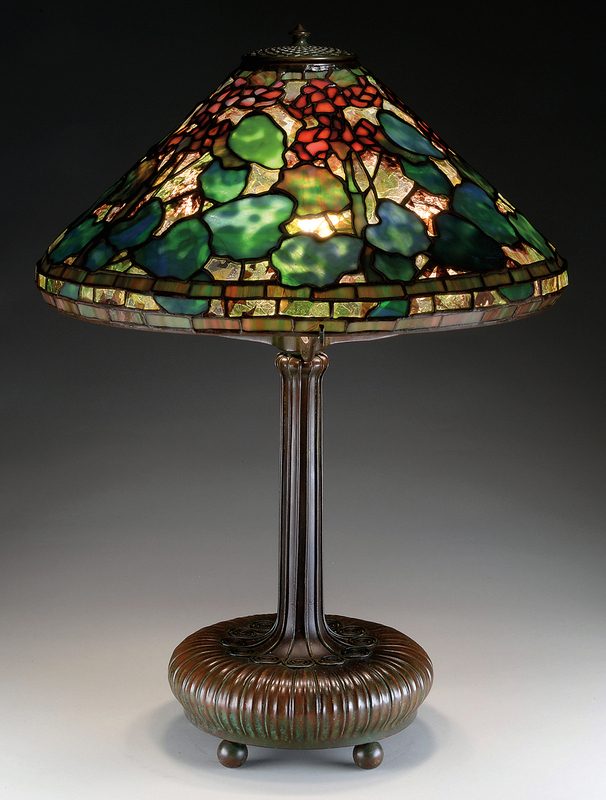 Tiffany Studios leaded glass lamps stole the spotlight in this sale. Both table lamps and hanging lamps generated high wattage bidding. Pull up a chair and check out these top table lamp highlights. Lot 2016, a stunning Drop-head Dragonfly table lamp buzzed to $130,000, while lot 2005, a Geranium table lamp with rich red flowers blossomed at $94,800. Lot 2100, a green, amber and yellow mottled glass Tyler Scroll table lamp wound its way to $23,107, and lot 2152, a blue Belted Dogwood with rich mottling hit $59,250. It was all systems go with lot 2185, a handsome green favrile bodied Moorish table lamp, which nearly doubled its high estimate to realize $14,220. And not to leave anyone hanging, lot 2081, a large leaded shade Black-Eyed Susan chandelier sold for $35,550. 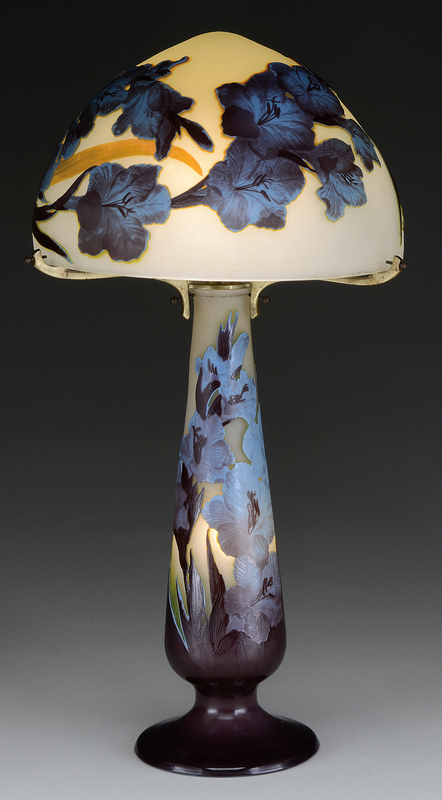 Other fine lighting highlights included lot 2318, a Duffner & Kimberly Wisteria floor lamp that flowered at $47,400 and lot 2553, a purple, periwinkle, green and cream Galle floral themed cameo lamp which came in at just a shade under estimate to realize $47,400. And collectors followed the call of the great outdoors with lot 2340, a Daum Nancy Rain Scene lamp selling for $23,700. This auction featured a fantastic assortment of gorgeous Galle vases. Three examples of the company’s mold blown treasures left buyers gasping for air. These included lot 2548, a bright pink floral Hyacinth vase, which realized $16,590; lot 2420, a shaded blue and purple Plum vase, which realized $11,850; and lot 2418, a red and yellow Cherry vase, which scored a juicy $11,850. And bird’s the word with another exceptional Galle rarity - lot 2554 - a cameo Penguin vase. This stunning example more than doubled its low estimate, chilling out at $46,689. Daum was another premier glass manufacturer in this sale. Collectors could not seem to get enough of the company’s fantastic cameo glass and wheel-carved examples, among other specialties. Lot 2472, a large glass vase featuring cameo paperwhite flowers, more than doubled its low estimate to realize $11,850. Lot 2504, a cameo and enameled vase with a clear frosted body and an internal rainbow decoration, was a colorful sensation at $13,035; while lot 2344, a wheel-carved cameo Poppy vase realized an astounding $11,850 - nearly four times its low estimate! Lot 2469, a gorgeous padded and wheel carved floral themed vase with a green foot and a mottled pink and purple background, was a pretty big deal at $17,775. And lot 2350, a Rain Scene vase - one of the company’s most treasured and collectible patterns - thundered to $11,850. Other highly collectible lamp and glass manufacturers also had a strong showing at this sales event. Lot 1263, a Webb cameo vase with intricately carved white cameo flowers, stems, and leaves was pretty in pink at $33,180. Lot 1430, a Suess Waterlily floor lamp, hit the ground running with bidders, eventually selling at $13,035. Lot 2461, a G. Argy Rousseau Poppies vase, bloomed at $11,257. And collectors put the pedal to the metal for lot 1453, a Pairpoint Puffy Rose Bouquet table lamp, which realized $9,480. Exquisitely manufactured and decorated pottery was another important category in this fine sale. The selection of Wedgwood Fairyland Lustre on offer was truly a dream come true for collectors. Lot 1225, a Malfrey pot decorated in the Sycamore Tree pattern climbed to $14,220, while lot 1216, miniature a Malfrey pot decorated in the Elves and Bell Branch pattern defied its petite proportions to realize $10,665. And lot 1226, an absolutely delightful Fairyland Lustre vase decorated in the Candlemas pattern with candles, heads and elves, caught fire to sell at $9,480. 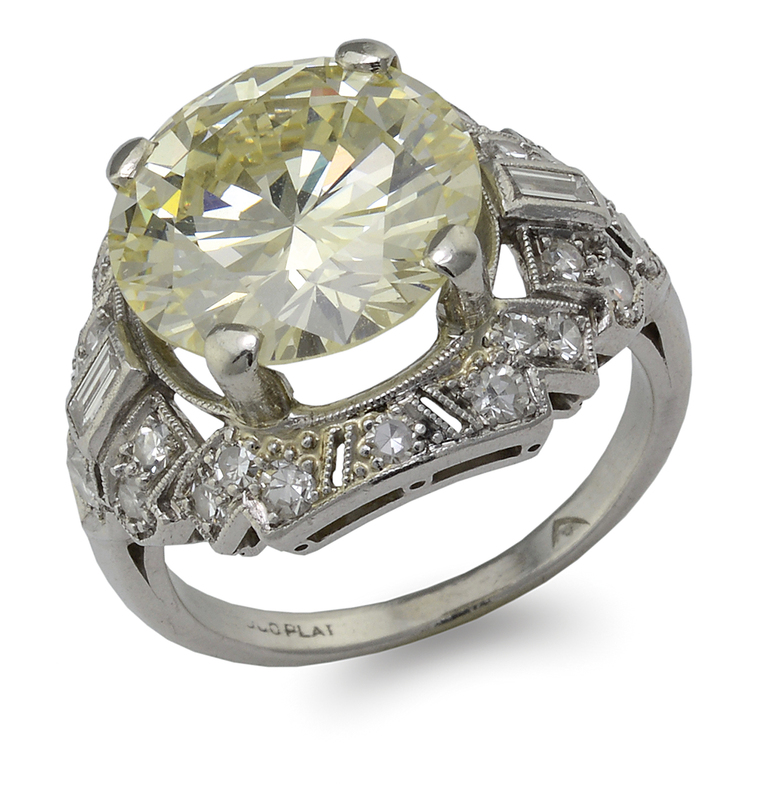 Bidders also took a shine to this auction's outstanding selections of silver and jewelry. 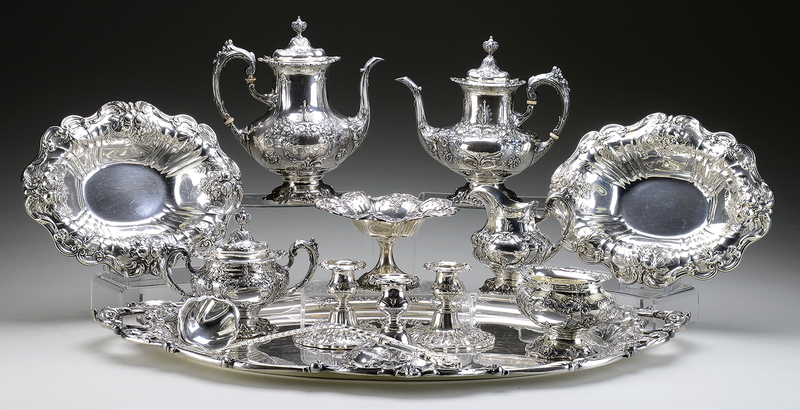 A heavy metal highlight in these categories would have to be lot 1193, a Reed & Barton Francis I Sterling Service, which took its rightful place at the head of the table in realizing $11,257. Other crown jewels here included lot 1111, a platinum Cape Diamond ring which doubled its low estimate to bling in $20,145; lot 1038, a Jaeger Lecoultre Master Control Grande Memovox watch which marked time at $10,665; and lot 1083, a gorgeous 18k Cartier jade and enamel compact, which expanded to $11,850. According to Mike Fredericks, James D. Julia’s Department Head, "The results of this sale again confirm James D. Julia as the premier auction house for the finest rare glass, lamps and fine jewelry in the market. I am so pleased with the outcome of this sales event as well as the energy and renewed interest it has generated. The sale represented the best available merchandise from the most collectible manufacturers, and collectors and enthusiasts truly responded in the best possible ways to these outstanding selections. Our next auction will be held in November, 2016, and our department is already accepting consignments for this much anticipated sales event." James D. Julia, Inc., one of the top ten antique auction antique houses in North America, is headquartered in Fairfield, Maine. The company also has an office in Boston, Massachusetts. In business for over 45 years, the company conducts high-end antique, collectible and decorative arts auctions throughout the year. Julia's routinely establishes new world records through its sales events. The company consists of three divisions, including rare firearms and militaria; fine and Asian art and antiques; and rare glass, lamps and fine jewelry. Each division is regarded for its excellence and is staffed with world-class specialists to ensure fair and professional authentication, identification, and valuation services. For more information on James D. Julia, Inc., please visit http://www.jamesdjulia.com. PLATINUM CAPE DIAMOND RING REALIZED $20,145. REED & BARTON FRANCIS I STERLING SERVICE SET REALIZED $11.257. 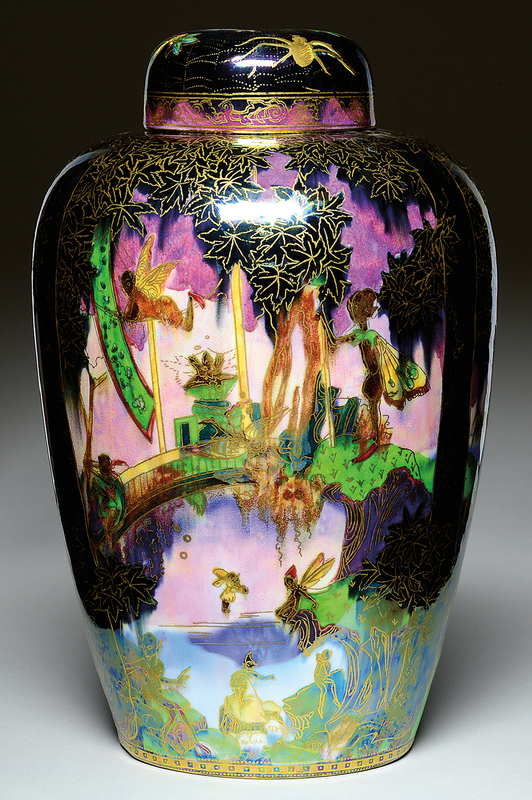 WEDGWOOD FAIRYLAND LUSTRE MALFREY POT REALIZED $14,220. 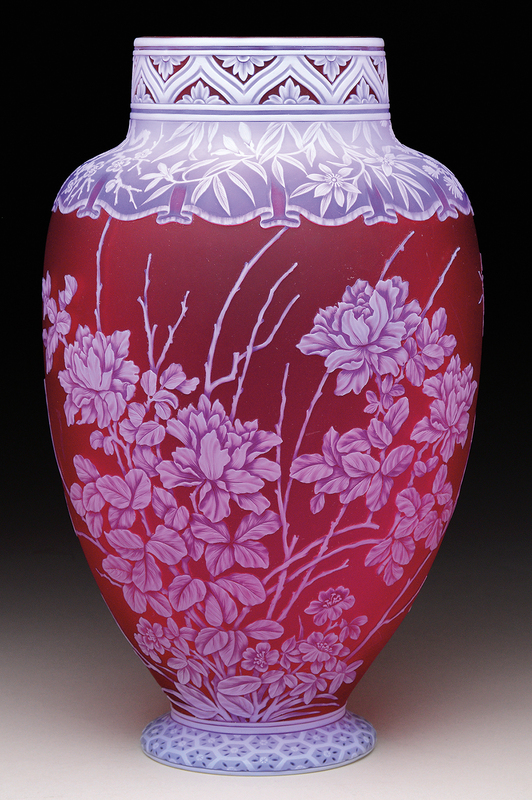 WEBB CAMEO VASE REALIZED $33,180. TIFFANY STUDIOS BELTED DOGWOOD TABLE LAMP REALIZED $59,250. 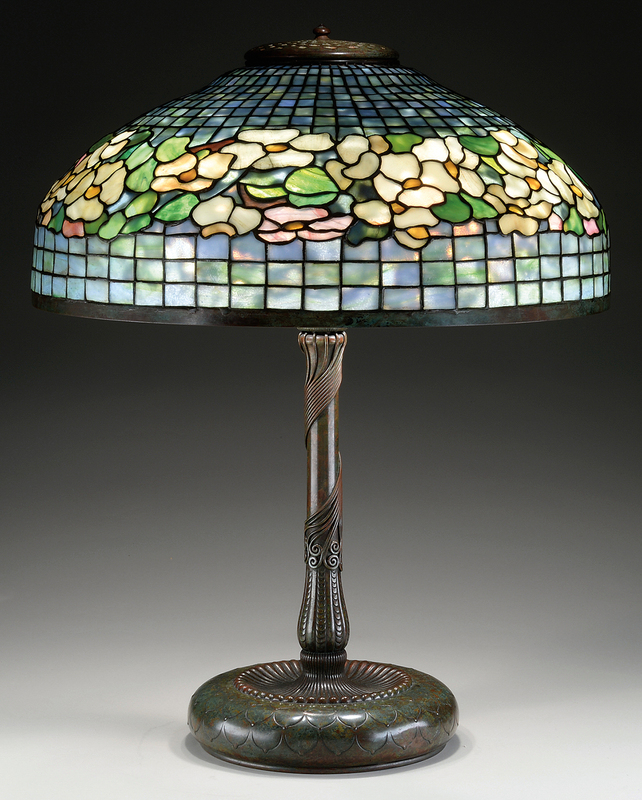 TIFFANY STUDIOS GERANIUM TABLE LAMP REALIZED $94,800. DUFFNER & KIMBERLY WISTERIA FLOOR LAMP REALIZED $47,400. 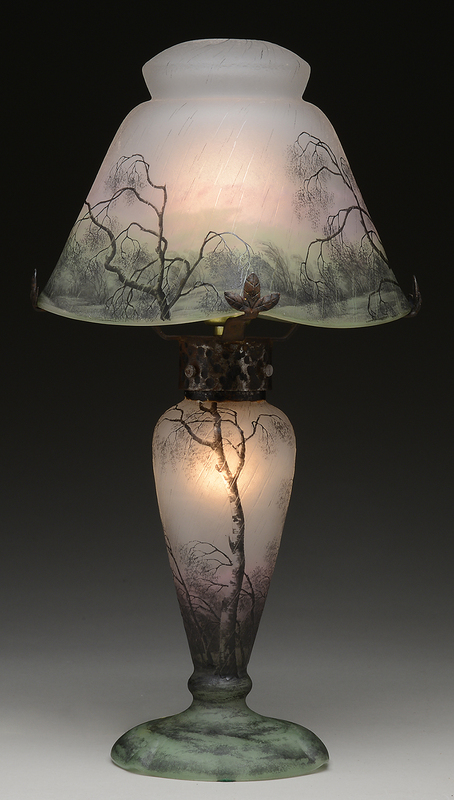 SCARCE DAUM NANCY RAIN SCENE LAMP REALIZED $23,700. 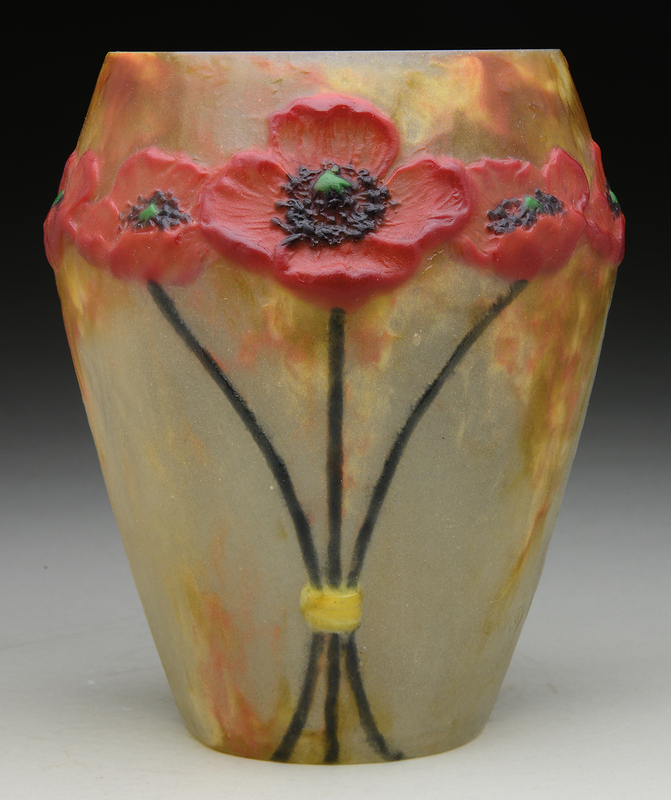 G. ARGY ROUSSEAU POPPIES VASE REALIZED $11,257. GALLE FOUR COLOR CAMEO LAMP REALIZED $47,400. 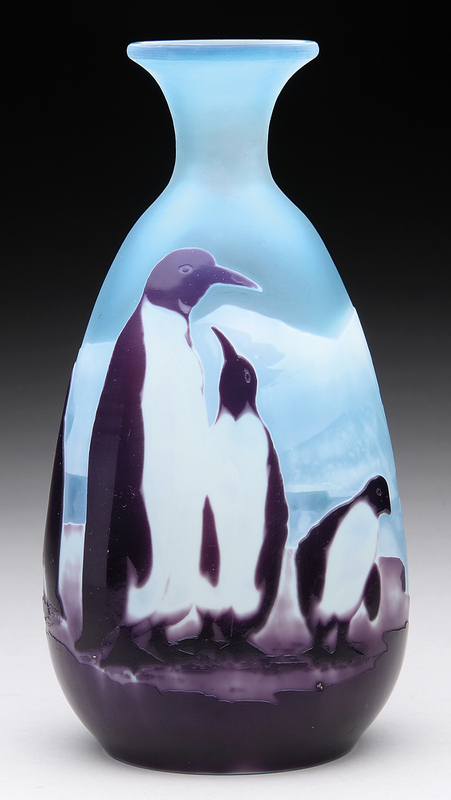 GALLE CAMEO PENGUIN VASE REALIZED $46,689.